We complete a Competitive Market Analysis of your specific property. Utilizing the computer MLS network system to obtain comparable Real Estate sales. Obtaining data on properties sold at Public Auction or private treaty. Personal knowledge obtained by experience in selling real estate by private treaty, Public Auction and MLS Real Estate network. Consideration of zoning and sub-division regulations that pertain to the property so as to determine best approach to obtain highest current value. Professional signs indicating the amount of acres if required, zoning and pertinent sale information. Variety of different newspapers and other media, including the Internet! Professional color picture brochures with all pertinent info. Complete deed plottings and boundary line descriptions for each property. Real Estate Broker Participation where warranted covering the Tri-County areas around the property. We need to have a complete understanding of the preferred time frame to sell your real estate, which alone depends on your personal circumstances. Most times your situation will dictate a preferred course of action to market your Real Estate. The sale of Real Estate has become more sophisticated and demands professional marketing and promotion including financing. The sale of Real Estate is no longer a simple “no strings attached” transaction. The Seller’s liability is at an all time high. Complete Seller Disclosure Statements must be provided for all Real Estate sold. Ninety to ninety-five percent of all buyers for Real Estate will be from within a 5 to 20-mile radius of the subject property in most cases. Professional representation of the Seller of Real Estate is extremely important and will almost always result in more net dollars for the Sellers. 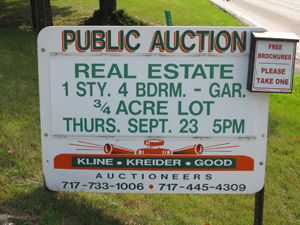 Partner/Owner Kline, Kreider and Good Auctioneers. Member of National and State Auctioneers Association. Member of Local Southeastern Dist. Auctioneers Association. Graduate of Mendenhall School of Auctioneers. Member of National and state Realtors Association. Member of Lancaster County Association of Realtors. Affiliation with Professional Legal Counsel specializing in Real Estate. Affiliation with several prominent lending institutions. Our auction staff consists of full-time Licensed and bonded Auctioneers, clerking staff, auction manager & support help for auction day. Marketing and sale of Real Estate is our full-time professional business. Twenty-four hour answering service for after hour calls. Professional photos & virtual tour for real estate. We offer two different marketing plans each with a different rate system. Plan #1: Commission of real estate sale price plus advertising expense. Auctioneers prepare all newspaper advertising, brochures, & signs. Complete deed plotting and boundary line descriptions. Complete market analysis of the property prior to Auction. Market analysis of Buyer’s realty when needed by lender for pre- qualification of Buyer. Advertise Auctioneer’s telephone numbers for prospective Buyers to call regarding terms, details, zoning, financing, etc. Preparation of Sale Conditions which include legal description, plotting, & seller disclosure. Arranging for an attorney or title company that may be required. Commission of real estate sale price plus advertising expense. All of the above are included. Broker Participation with realtor of county & surrounding counties of property being sold. Includes a referral fee offered to any Real Estate Broker/Agent who registers a perspective buyer with the Auctioneers prior to the Auction in accordance with the auctioneers’ requirements. This unique marketing tool has become very successful by having Realtors cooperation with the Public Auction method of selling Real Estate. 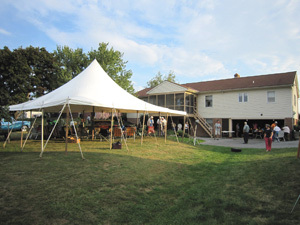 Professional marketing and promotion of Real Estate at Auction is not as much a cost to you as it is an investment. Our collective goal is to sell your Real Estate to a Retail Buyer for a fair market value.